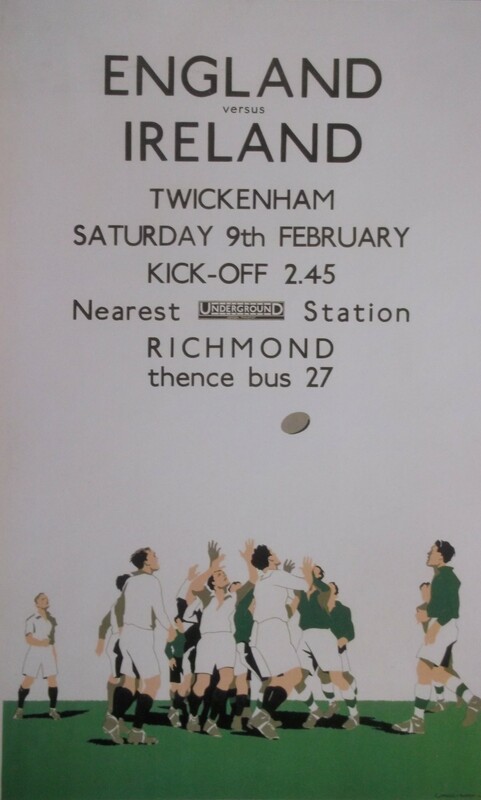 As England take on Ireland tomorrow (at Rugby football rather than cricket, I suppose it is now necessary to point out), a look at how the equivalent fixture was advertised by London Transport in 1934*. Rather more elegantly, I’d say. The artist is Charles Burton. I’m not sure he was fully conversant with the rules of Rugby, given the unlikelihood of the situation depicted occurring in a match, but he has made inventive use of a limited palette (green, white, black and grey). Was this, I wonder, a purely artistic decision or was it dictated in some way by the limitations of the printing process? Or perhaps, like the Blackpool trams of my youth, this was the livery of the railway company concerned? I’m not sure which theory this supports, but a similar limited palette is in evidence from January’s selection (for yes, I am “borrowing” these images from the calendar on my wall). This was published by the Underground Electric Railway Company Ltd. in 1913 and the artist was Sidney Thomas Charles Weeks. Again, I doubt realism was the primary motivation for the colour scheme. A white polo-necked jersey would hardly have been practical for diving in the mud, and I don’t believe any footballer prior to Alan Ball in his Blackpudlian youth wore white boots. Most of the clubs advertised (if not the venues) are still familiar, but the Queen’s Club (now better known for tennis) was where the Corinthian F.C. played most of their home fixtures. London Caledonians were an amateur club (the equivalent of London Scottish at Rugby football, I suppose), who were a power in the Isthmian League, but failed to reconvene after World War II. 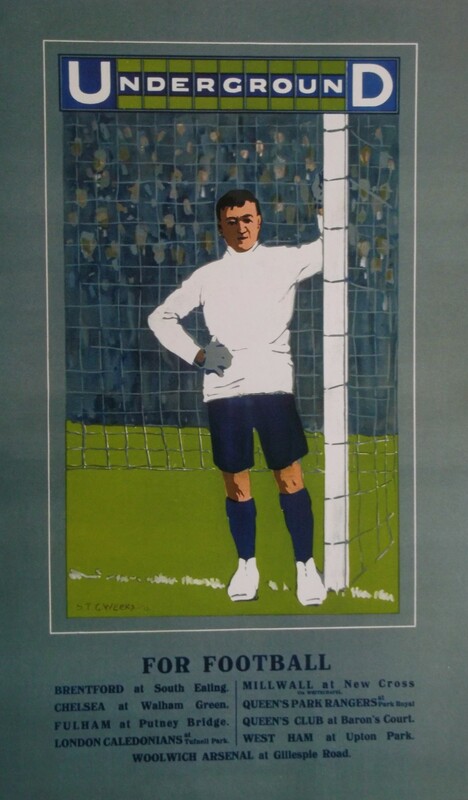 * Although this poster was, apparently, published in 1934, it seems to be advertising the 1935 Home Nations fixture, which was won 14-3 by England. Ireland, however, went on to win the Championship. Let us hope that is not an omen!